We can’t get enough of tahini lately, so this tahini-packed cake is right up our alley. Tahini gives this tender cake a nuttiness that’s balanced out by our bright and zesty orange buttercream. Simple and elegant, it’s the perfect springtime dessert. Preheat oven to 325°F (170°C). Butter and flour 2 (9-inch) round cake pans. Line bottom of pans with parchment paper; butter and flour again. In the bowl of a stand mixer fitted with the paddle attachment, whisk together flour, sugar, baking powder, salt, and cinnamon by hand; make a well in center of flour mixture. With mixer on low speed, add milk, tahini, and vanilla, beating until almost smooth, stopping to scrape sides of bowl. Add eggs, one at a time, beating well after each addition. Divide batter between prepared pans. Tap pans on counter twice to release air bubbles. Bake until a wooden pick inserted in center comes out clean, about 25 minutes. Let cool in pans for 10 minutes. Invert cakes onto wire racks, and let cool completely. Using a serrated knife, slightly trim top of cake layers to level, if needed. 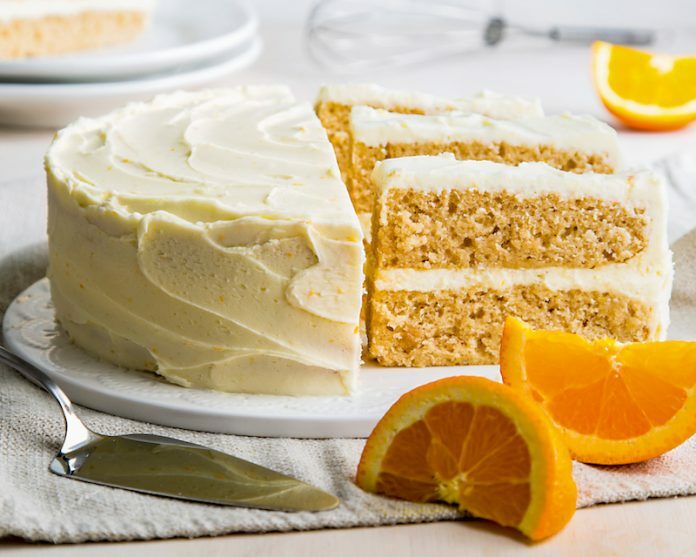 Spread Orange Buttercream Frosting between layers and on top and sides of cake. Loosely cover and refrigerate for 30 minutes. In the bowl of a stand mixer fitted with the paddle attachment, beat butter and zest at medium speed until creamy. Gradually add confectioners’ sugar, orange juice, milk, and salt, beating until smooth. This frosting can be made ahead and refrigerated until ready to use. Just beat with a mixer with an extra tablespoon or two of milk, if necessary. Pro Tip: Some brands of tahini need to be thoroughly stirred before using, but once stirred, it should stay smooth. If needed, spoon it into a bowl and whisk by hand or beat with a mixer at low speed until smooth. Yum!!!! Yes, it’s the perfect springtime dessert.